If you want a shot at IT help desk jobs, your resume needs to best portray your unique experience in the technology field. 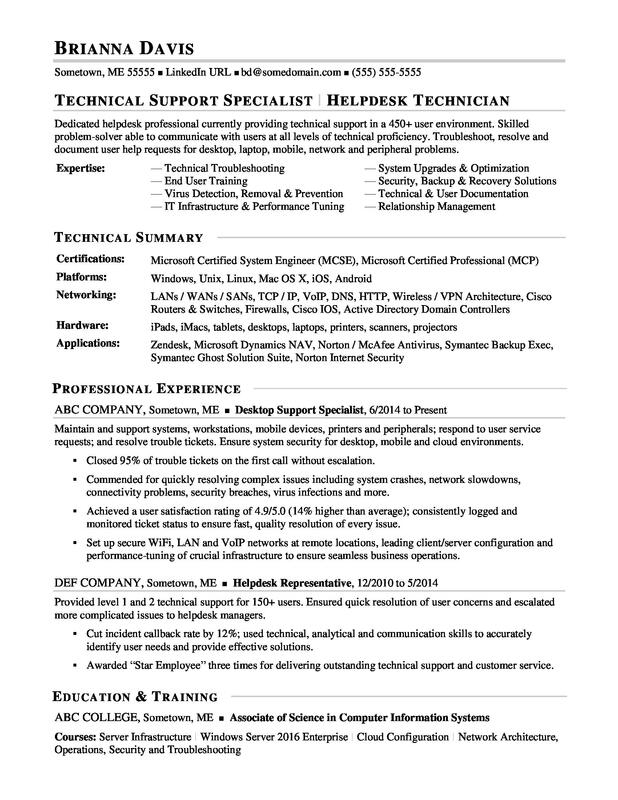 For inspiration, view the sample resume for an IT help desk worker below, and download the IT help desk resume template in Word. Jobs working the IT help desk are projected to grow by 11% (Or 88,500 jobs) from 2016 through 2026, according to the Bureau of Labor Statistics (BLS). You’ll find the highest level of employment for this job in the following states: California, Texas, New York, Florida, and Illinois; and in the following metropolitan areas: New York City, Chicago, Dallas, Atlanta, and Washington, DC. As an IT help desk worker, you can expect to make a median wage of $52,810 per year, or $25.39 per hour, according to the BLS. Additionally, you can learn more about IT careers and search for IT help desk jobs on Monster. Dedicated helpdesk professional currently providing technical support in a 450+ user environment. Skilled problem-solver able to communicate with users at all levels of technical proficiency. Troubleshoot, resolve and document user help requests for desktop, laptop, mobile, network and peripheral problems. Maintain and support systems, workstations, mobile devices, printers and peripherals; respond to user service requests; and resolve trouble tickets. Ensure system security for desktop, mobile and cloud environments. Closed 95% of trouble tickets on the first call without escalation. Commended for quickly resolving complex issues including system crashes, network slowdowns, connectivity problems, security breaches, virus infections and more. Achieved a user satisfaction rating of 4.9/5.0 (14% higher than average); consistently logged and monitored ticket status to ensure fast, quality resolution of every issue. Set up secure WiFi, LAN and VoIP networks at remote locations, leading client/server configuration and performance-tuning of crucial infrastructure to ensure seamless business operations. Provided level 1 and 2 technical support for 150+ users. Ensured quick resolution of user concerns and escalated more complicated issues to helpdesk managers. Cut incident callback rate by 12%; used technical, analytical and communication skills to accurately identify user needs and provide effective solutions. Awarded “Star Employee” three times for delivering outstanding technical support and customer service. Everyone needs a little support from time to time. When it comes to your resume, could you use some help standing out from the competition? Get a free resume evaluation today from the experts at Monster's Resume Writing Service. You'll get detailed feedback in two business days, including a review of your resume's appearance and content, and a prediction of a recruiter's first impression. Think of it as quality assurance for your job search.